To celebrate its 60th anniversary of professional services in Italy, KPMG chose Simmetrico and the creative proposal “The Place to Be”. Our concept was of a place bursting with energy, able to anticipate change and ready to welcome people and talent; a place that values differences and generates the kind of opportunities that we are all looking for. 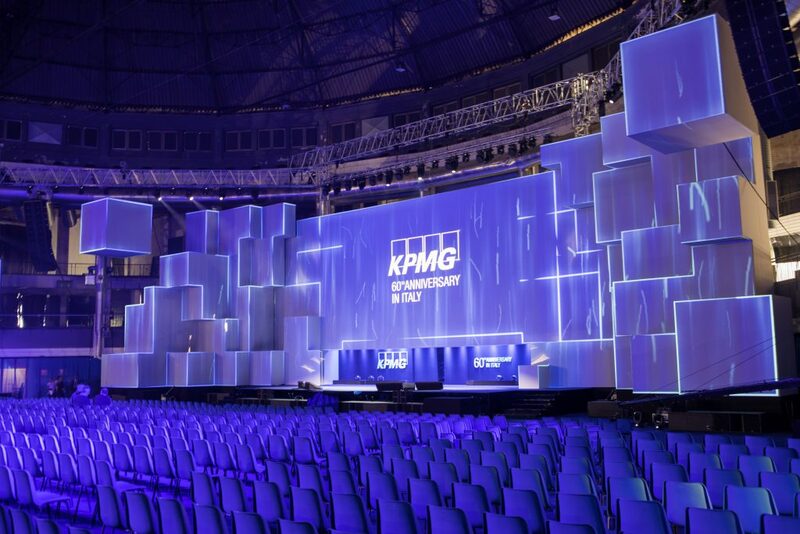 This place is KPMG: “The Place to Be”. 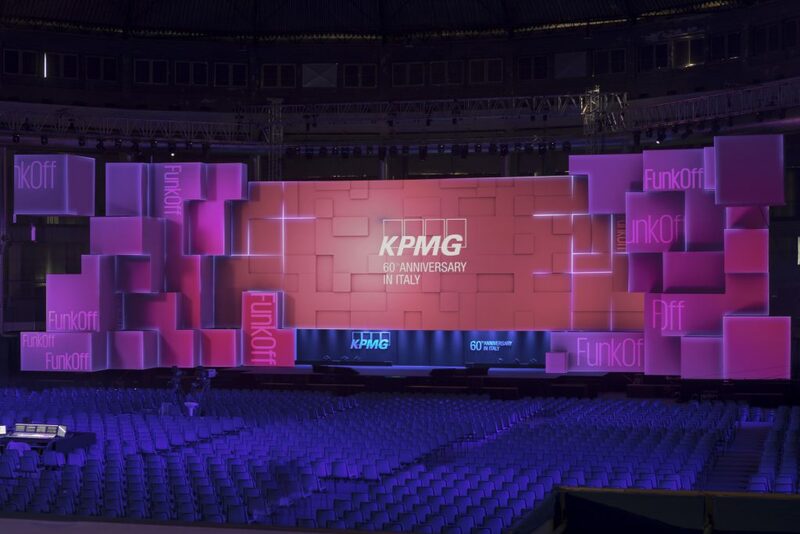 This was the first event to bring together the entire KPMG network in Italy and was held at the Palazzo delle Scintille in Milan. 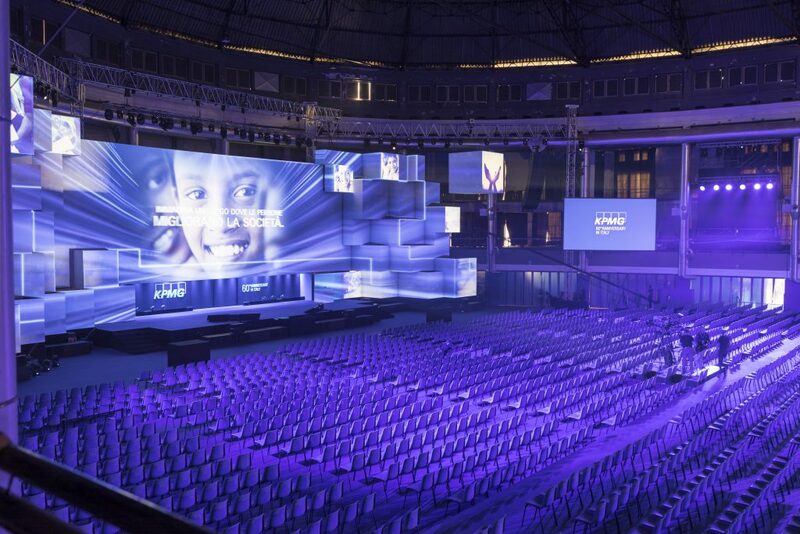 Over four months, Simmetrico handled the design and production of the whole event with a team of over 200 people. Guests were greeted by a 50-metre graphic gateway and 2×20 metre letters declaring this “The Place to Be”. The event covered a space of 8000 m2 and involved 7800 m2 of carpets, 3000 m2 of seating 3 marquees to expand the catering area, and 600 m2 of lounge and backstage rooms. 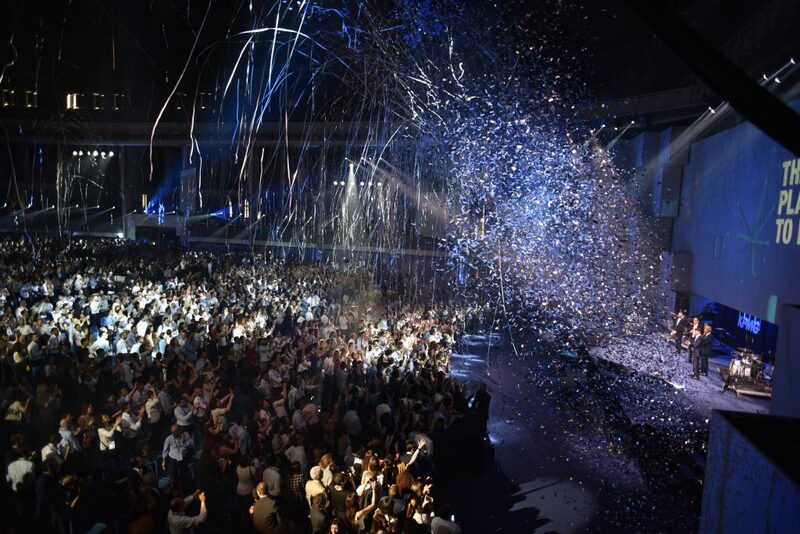 Real-time accreditation of 4000 people took place without any waiting time thanks to the fully integrated app, specially created for the occasion, which also communicated with participants in the build-up to the event through push notifications. The set design included a 40×15 m multi-level set that was entirely suspended and provided the backdrop to a video mapping sequence made with 40 projectors and 250 light fixtures for a total projected area of ​​over 1000 m2. 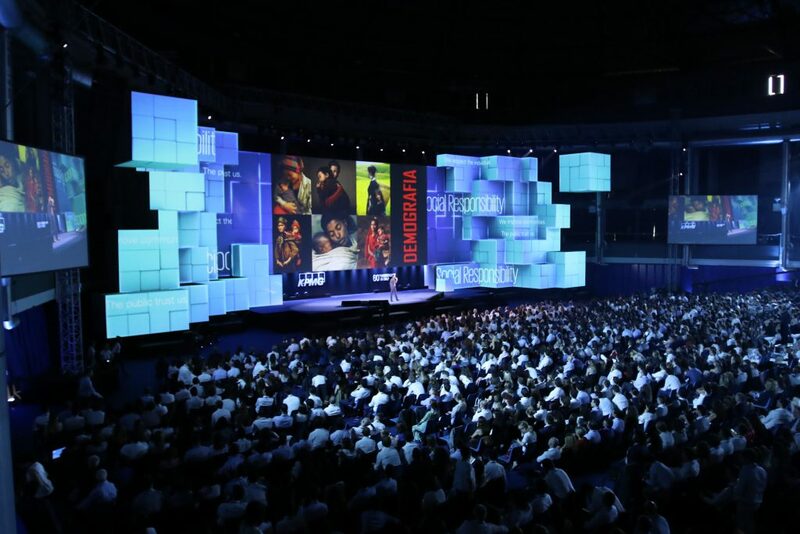 The event saw the production of 50 original videos, 6 live cameras followed the entire event and a 100,000-watt audio system. 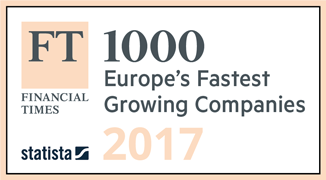 Host for the evening Alessandro Cattelan presided over a busy programme, inviting 11 exceptional speakers to the stage: KMPG management, four testimonials for the 4 network values, and guests to talk about innovation, technology and leadership. The evening came to an end with a fantastic concert from Funk Off’s funky march band first with Italian singer Elisa as a surprise grand finale. The event received full coverage on social media with a 5-hour live stream on Facebook, LinkedIn and Twitter and the dedicated hashtag #theplacetobe. 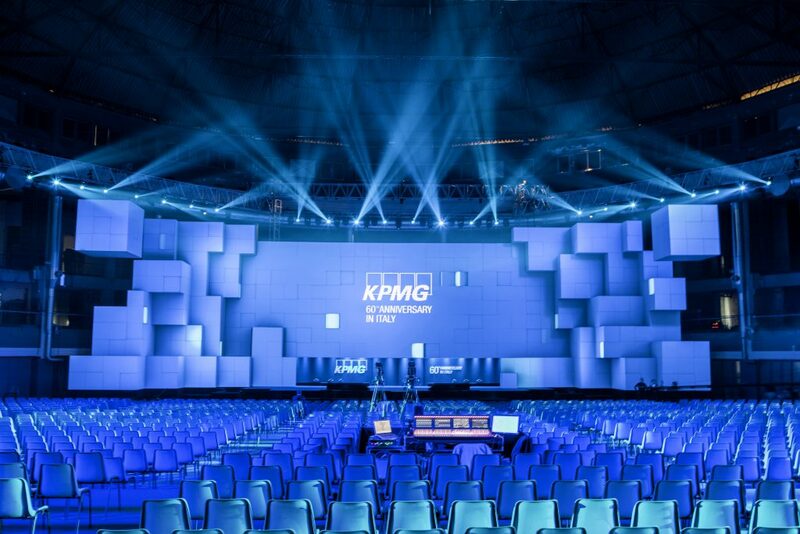 The KPMG Italy Instagram profile was activated for the occasion with 5 hours of live-upload.